The Godbomb arc is a story worthy of the most righteous and virtuous adjectives. Ones that I will attempt to deliver, to be just to the creators. The book has a wondrous resonance between art and writing with Jason and Esad, creating a masterful epitome of the Gods. 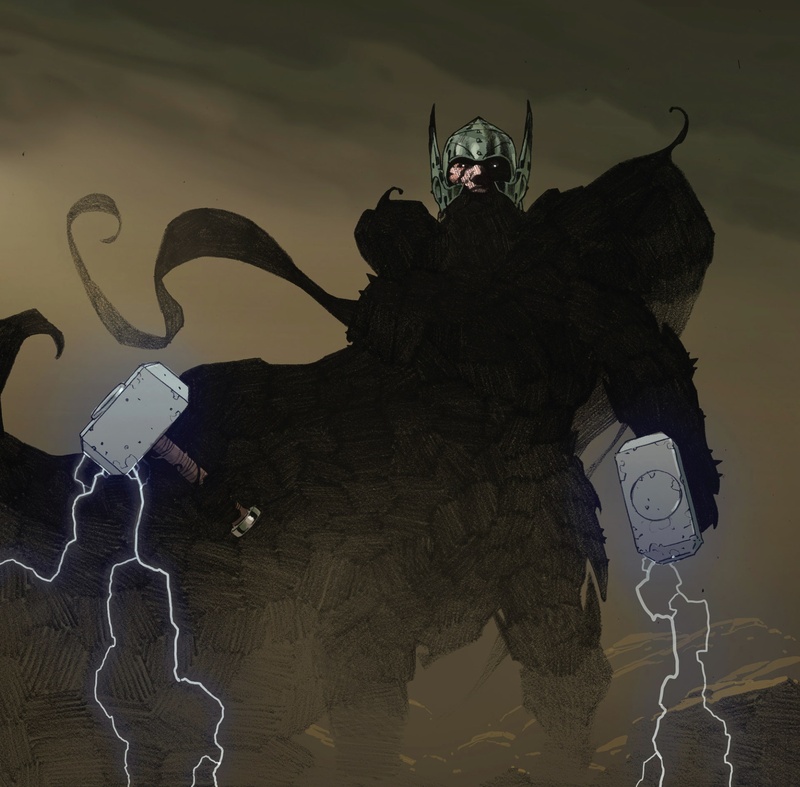 I initially focused on Esad’s art in a very early iconic art post (http://wp.me/p2DUQc-ap) and was in awe and wonder of his ability to make Thor feel small and fearful of a Godkiller. I never expected that the culmination of the story arc would involve transforming Thor into the King of all Gods. Those words may be thrown around idly but with this comic book, it’s a perfectly apt description. Instead of reviewing the comic I decided that there was one moment that was symbolic of all that was sublime about this series. This page, of all the two hundred and forty-two pages of eleven issues, transcends Thor into holy sanctity. Jason Aaron’s prose provides a great summary of the common themes of the book and the fates of all Gods everywhere. They all collapse and crumble whilst visualising the same final image as they die. The simple idea of all our deities succumbing to a weapon, so advanced that they need to look to another for hope, is a desperate and foreboding one. The end must be nigh if the people we worship are unable to provide us with solace. The great desolation that is left when all else has failed, is immersed with this final image of Thor. The sheer will and determination of this individual to stop the murder of all celestials, is a sight to behold and embrace. The light emanating from, not one, but two Mjölnirs is the hopeful glow that radiates over a dying Thor, trying to avoid drowning in a sea of black. 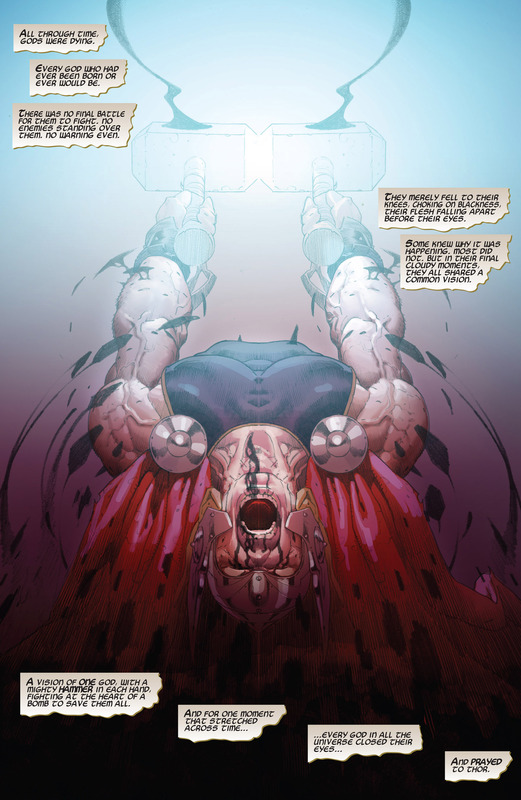 His body is arched backwards as he screams with his eyes closed and every muscle, tendon and vein is at full stretch holding him together as his body is torn asunder. Esad draws a Michelangelo sculpture with every muscle perfect and symmetrical, a vision of ethereal beauty. The colours are so delicately balanced and lit, with his tilted head forcibly embracing the darkness. We observe him smashing together the hammers he holds so dear, trying to stop the birth of a Godless universe. In front of our eyes we witness the pursuit of martyrdom as we retire to requiescence. There is nothing left to do but hope that Thor succeeds, whilst we pray to the only God left worthy of our prayers. What we are fortunate to be reading a tale of wondrous Thors and an overwhelmingly powerful antagonist with an undeterred motivation for deicide. For years we have read Odinson as the dull and powerhouse of the Avengers or as a central character in a soap opera called Asgard. This book strips the banality of the everyday world making it completely unrealistic and unbelievable. It makes us imagine a world greater than our own, with heroes championing the highest moral imperative. This is no God amongst man trope, this is a book about a God amongst a realm of Kings. Jason Aaron writes eloquently and beautifully, lacking common and modern colloquialism, but beholding a majestic lexicon. However it is Esad that imagines the landscapes of tranquillity and terror, filled with grand heroes and ignoble villains, befitting a world far away from all we know. At the end of this stunning body of art, I am not sure I believe in God, but I do believe in Thor. Previous PostThe Theatre List 14/8 – It is the who’s who of comic writers!